Following the traditional riding trails into the heart of the Icelandic highlands is a new adventure and a challenge for everyone. Being so close to the beating heart of nature comes along with new experiences and leads you to cross unknown boundaries. Riding Iceland tours are designed to follow the ancient riding trails that have served people to travel across the country ever since the first settlement of Iceland. We will come across perfect riding tracks that allow you to enjoy your horse tölting at full speed – a cheering and overwhelming feeling on its own. 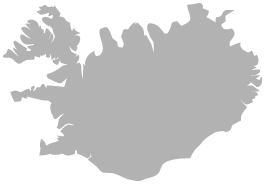 It is almost impossible to participate in a Riding Iceland tour without knitting very close and lasting friendships both with men and horses. Together you will face the different challenges of the day and together you will solve them. 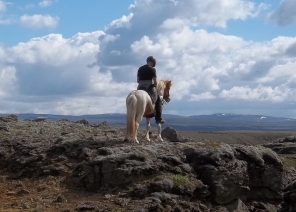 A perfect event to learn to master the riding of the Icelandic horse. Elvar and Fjóla at Syðra-Skörðugil, Skagafjörður in the north of Iceland are the new members of Riding-Iceland team. 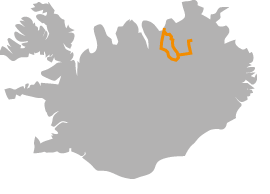 Every summer in about 15 years they have been travelling on horses with groups of riders in Skagafjörður. The fjord Skagafjörður is famous for the history, amazing landscape and the hospitality of the locals. 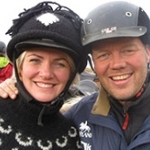 Bjarni Páll and Elsa, at Saltvík have been operating riding tours with their family from Saltvík horse farm for over 20 years, presenting mostly the north of Iceland with its most beautiful faces. 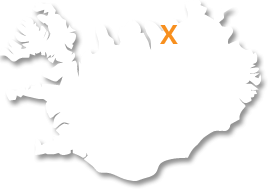 They also offer more challenging tours crossing the whole of Iceland. 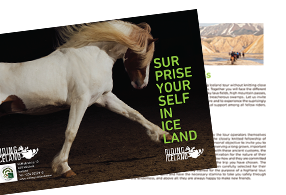 The Icelandic horse, snow and ice are fascinating phenomenon that you meet at Lake Mývatn on the horseman's weekend annually in March. It is hard to find the words to describe the most amazing week of my life. Not knowing exactly what to expect, we drove with nervous anticipation from the airport to the farmhouse in Kjóastaðir where we started the tour, everyone trying to imagine the adventure that lay in front of us. 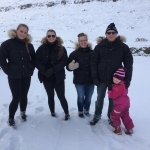 We were greeted by Siggi and the rest of the Riding Iceland Team and by the time we finished our welcome dinner that night everyone was bonded, donning new Icelandic sweaters and so excited to go.